It is designed for comfort and utility. Soft shell type jacket with an insulated liner and zip up front. Roll out Hood that can fold into a collar. 2 sleeve zipper pockets; 2* 4" x 4" sleeve patch panels; 2 high rise slash chest pockets; Forearm pocket for key etc small accessaries;2 zipper back pockets; Underarm vent zipper; Double layer reinforced forearm; Drawstring waistband and hood; Adjustable wrist cuff. Front pocket with Long zipper and back pockets design, you can take anything from pockets when you wear a backpack or tactical vest.Total 8 pockets on front and back size for many EDC gear equipment, tactical knife, pen, wallet, flashlight, Clip and Cell Phone etc. 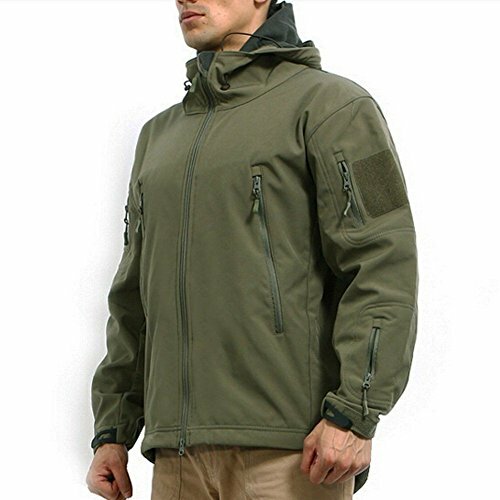 Ideal Military Army Outdoor Tactical Combat Shooting Paintball Airsoft Hiking Camping fishing hunting lightweight warm Jacket with fleece coat. It's Asian Size which is 1-2 size smaller than US size.Please choose 1-2 size up. The Size Chart is just for reference only,and allow 0.5-1" differences due to manual measurement. Front pocket with Long zipper and back pockets design, you can take anything from pockets when you wear a backpack or tactical vest. Total 8 pockets on front and back size for many EDC gear equipment, tactical knife, pen, wallet, flashlight, Clip and Cell Phone etc. If you have any questions about this product by ArmyCamoUSA, contact us by completing and submitting the form below. If you are looking for a specif part number, please include it with your message.